Tom Daschle points to multimillion-dollar settlement with "person of interest"
WASHINGTON (CNN) -- An intended recipient of one of the anthrax-laced letters sent in 2001's anthrax scare said Monday he was "very skeptical" of the government's investigation. 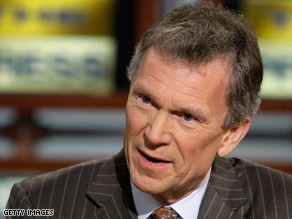 Former Senate Majority Leader Tom Daschle was an intended recipient of an anthrax-laced letter in 2001. Former Sen. Tom Daschle, who was Senate majority leader at the time, said he is suspicious of the case against researcher Bruce Ivins because of the government "bungling" of Steven Hatfill's case. Hatfill, who was named by the Justice Department as a "person of interest" in 2002, was never charged and later sued the department. They reached a multimillion dollar settlement in June. "Given their checkered past and the difficulty that they had in getting to this point -- the bungling of the Hatfill part of the investigation -- leads me to be very skeptical," the former South Dakota senator said. Ivins, an anthrax researcher at Fort Detrick, Maryland, committed suicide last week before he was to have discussed a plea deal in the anthrax case with prosecutors, officials said. Ivins, 62, died at a hospital in Frederick, Maryland, where he was taken after he was found on a bathroom floor at his home. No charges have been made public. Sources close to the case said the government may pronounce it closed as soon as Tuesday. The decision to close the probe is part of a set of events in which the government will first ask a federal judge to disband the grand jury that was hearing the case, then request the case documents to be unsealed. After that, the Justice Department plans to brief the victims and their families in Washington before publicly releasing details of the case against Ivins, several sources with knowledge of the investigation said. A letter to him containing anthrax spores was opened by one of his staffers, exposing 20 people in his office to anthrax. None of them became ill.
"I've been completely left out with regard to any understanding of the progress of the investigation or what these latest developments may mean," he said. What are the health risks of anthrax? The anthrax mailings killed five people and sickened more than a dozen others after the September 11, 2001, attacks. Ivins, of Frederick, worked for decades in the biodefense lab at Fort Detrick, where he was trying to develop a better vaccine against the anthrax toxin. The FBI had traced the anthrax used in the attacks to the lab by using a new genetic technology, a U.S. official familiar with the probe said. Authorities were looking at whether Ivins may have released anthrax as a way to test a vaccine he was working on, another official said. "The labs were not equipped, for instance, with a lot of the equipment that would have been required to supposedly dry this material down and create the highly refined state that it was in," said Adamovicz, who worked with Ivins for 12 years. Adamovicz also said Ivins showed no signs of being homicidal or suicidal, including when he saw him just three weeks ago. "He seemed ... quite conversant, and he was his old self," Adamovicz said of his former colleague. "Those of us who have known Bruce have never seen that side of him," Adamovicz said, referring to allegations that Ivins was capable of murder. The woman told the court in her complaint that Ivins had spent time at a Sheppard Pratt mental health facility. There have been no arrests in the anthrax probe, which started after letters containing anthrax spores were sent to congressional offices and news organizations. Among those who died were two postal workers. Two contaminated letters were sent to senators, exposing 30 staffers. CNN's Kevin Bohn and Brianna Keilar contributed to this report.